from absolute beginner to master teacher. This year’s conference takes place at the Sedona Performing Arts Center | Red Rock High School, giving visitors a singular gathering place from which to explore the city and surrounding area’s diverse offerings. Beginners welcome. Experts, too. No matter where you are in your yogic journey, there’s so much to learn at SYF2019. Hatha. Ashtanga. Acro. Adaptive. Restorative. Jivamukti. Kundalini. Yin. Thai. Explore them all. Focus on a specific body part, a special posture or a specific goal. Whatever makes you bloom… Sedona Yoga Festival will provide. “Traumatic Stress: Resiliency and Healing with Yoga” is designed to provide teachers with the skills to share yoga with First Responders, Veterans, trauma survivors, PTSD and TBI sufferers and many more. Scientific studies now show that yoga and other mindfulness practices have a significant positive contribution on alleviating PTS and STS symptoms, and on strengthening body and mind resiliency. Students will leave this Sedona Yoga Festival Trauma-Sensitive Yoga Training with the necessary tools to benefit this population. 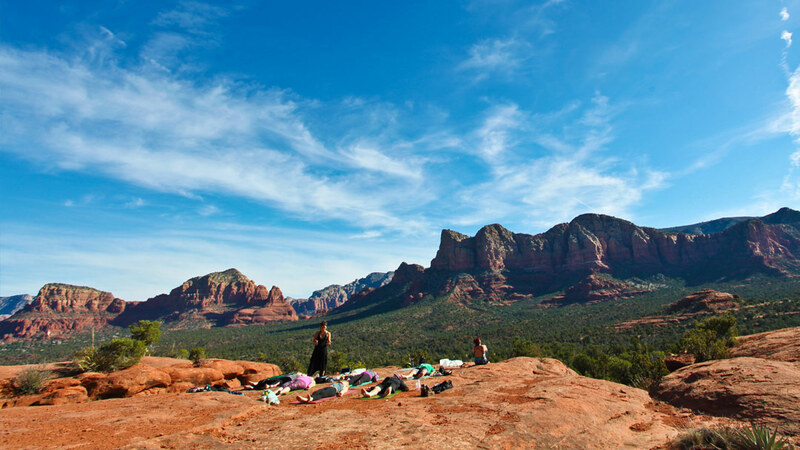 If gathering for a yoga festival isn’t a high enough energy already, Sedona’s picturesque landscapes and over 400 miles of world class hiking and mountain biking trails will for sure bliss you out.